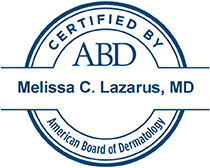 Melissa Lazarus is a highly skilled and well-respected expert in the health, care, and treatment of skin and skin diseases. Board certified by the American Board of Dermatology and the National Board of Medical Examiners, and a fellow of the American Academy of Dermatology and the American Society for Dermatologic Surgery, she specializes in aesthetic dermatology, general dermatology, and surgical dermatology, including the treatment of skin cancers. Located in Miami Beach, FL, Dr. Lazarus believes not only in treating the whole patient, but also the whole family. Located in beautiful Bay Harbor Islands, just steps from the Bal Harbour Mall on historic Kane Concourse, our state of the art facility is easily accessible from Miami, Miami Beach and Aventura. Visit our dermatology office located in Bay Harbor Islands. Check out testimonials and read reviews from real patients. Meet Dr. Lazarus and the rest of her amazing staff. Use our online booking system to schedule a consultation. The information on this website is for educational purposes only. Accordingly, any information contained within should not be construed as medical advice, evaluation, or consultation and should never be considered a replacement for a formal evaluation by the physician in his/her office and related consultation.